We had 10 airplanes and about 17 people that showed up for this event. 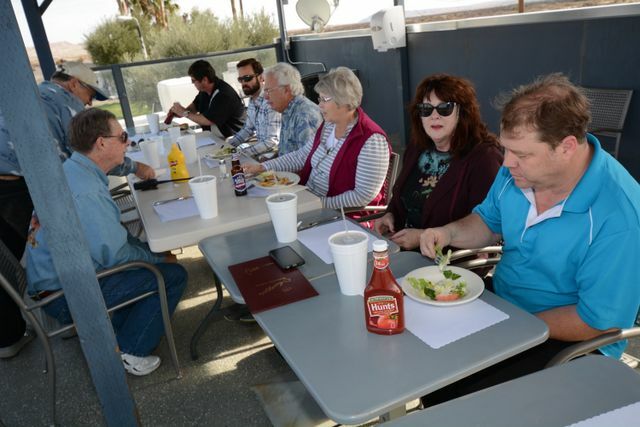 We had beautiful weather and a great time was had by all.. We asked for input in the upcoming years calendar andthe response was that they enjoyed this type of event (as well as some others). So we may do another one like this next month. We had 6 people that walked or rode in the parade. It was the 7th year with this float. We had 9 planes and 9 pilots, but 10 judgings since one pilot flew 2 airplanes for this first time event. Mark Wilson flew both the twin Bonanza and the Family Cessna 140. The winner of the wvwnt was Bob Hume in the twin Bonanza. We had 3 planes and 5 people that actually made it to Borrego as broken planes and bad health stopped others. The Casa sent the van for 3 of us while Steve and Heidi rode their bicycles. They fit their bikes in their palne for the ride over. The food at the Resort was excellent. The day was beautiful wtih sunny skies and low winds so it was not bumpy. We had 20 people that showed up at Bo Humes hanger for Movie night. FFCAP provide a mild chicken curry, tortilla soup and beef stew. Others brought salad, bread and a host of deserts. We tried to give the choice between the Bob Hoover story and Mad, Mad ,Mad World, but whe everything evened out we the player wouldn't player the Bob Hoover movie so we will do it another time. Mad World is a hilarious comedy and every ended up well fed and laughing throughout the movie. The Awards dinner was held this year at Pala Mesa Resort. Coming south on the 15 is much easier than going north. The meal was excellent and a good time was had by all. This year was a real group effort with FFCAP, CAP, and the Antique Auto club all being at the event. FFCAP had the Whistling Windsock Cafe and was serving burgers and hot dogs. There were planes from FFCAP and CAP that were on display and in addition about 20 antique autos. This was the sixth year for our permanent float being in the parade. It was fixed up, checked out and towed in the parade with several volunteers walking along the route. This event is an annual event at the Bacon Strip Ranch a 40 acre piece of desert right next to a dry lake bed. 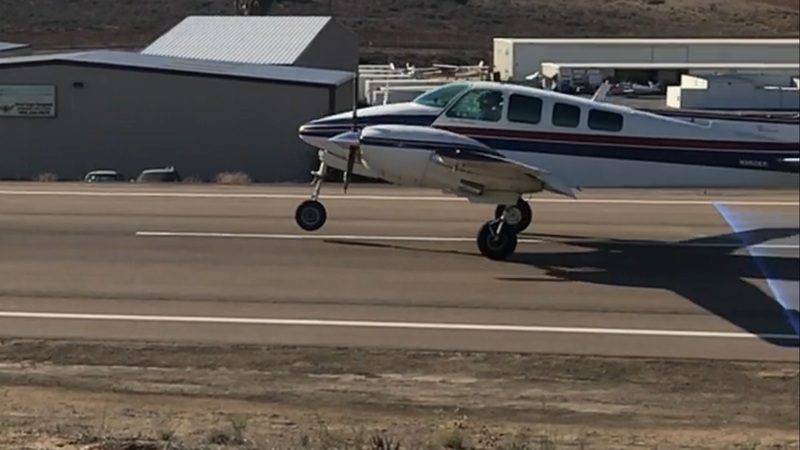 The landing is on the dry lake and the surface is smoother the Fallbrook runway. There is aproximatele a 2000ft strip and then a very slight turn to the right and an additional 2000ft that take you to the ranch gate. Aircraft parkingis inside and you camp with your plane. The is a large permanent shade cover with chairs and tables an a BBQ for cooking or you can cook in your camp. Over the course of the weekend we had 26 airplanes that showed up. the farthest was from northeast Utah. The weather was beatiful with warm days and cold nights. A great time was had by all. Fallbrook was well represented as we had a majority (or close) of the planes coming from our airpark. This was a small event. We ended up with one airplane and 3 of us in it. The cafe at Camarillo is really good, and the museum is walking distance. There was a 40 min wait to eat so we went to the museum first. It is the CAF museum so there are planes that have been restored by the local people. We broke our Attendance record with over 100 guests. We had Lt Col Rod Dyckman provide a presentation on his time flying the SR71. Held a raffle and had a series of new members join. A real successful event. We had 5 Airplanes and 1 driver that attended the lunch and tours. We showed Final Countdown as the movie, and had a superior dinner of Chicken Curry with ric, Beef stew with bread, Ceasar salad, and desert. We had 14 people attend this event and a good time was had by all. The weather was kind of iffy for Saturday so the turn out was low. We had changed the destination due to the high winds predicted for the Borrego area. It ended up with just 2 planes. A third tried to come, but the battery was dead so he couldn't start it. A little mist was all we ran into, and came back just after the rain shower went through.We hope for a better turn out next month. We took the Float to the Parade and had about 12 people that joined in driving and walking the parade route. This included 3 children and 2 teens. We had a good time and a good showing. I will add pictures as soon as I get them. We held the General meeting and for the entertainment we had a speaker (Jeffrey Vowels) who gave a presentation about the Cuban missle crisis from his prospective as a Naval Officer working with the CIA in south Florida. He was one of those who help gather information that showed their were missiles in Cuba. We had 21 people and a great spread of food. It was a busy day at Ramona. Lots of airplanes flying around formation flights and show by the Yaks. Booths and music and food. Cal Fire equipment on display and flight by them. A shame it was only Doug and I flying in from Fallbrook. We supported Chapter 1279 at the EAA booth. Another successful Young Eagles rally. We ended up flying 38 children with 10 airplanes. The weather was beautiful it was a warm October day with not a cloud in the sky and winds calm. Our Thanks to all who participated. Pictures will be posted on Chapter 1279 website. THere is a link under the Young Eagles tab. We had 6 airplanes and 11 people who made it up to Big Bear. They certainly made us feel welcome. Fuel is much cheaper than down here, and it was a nice 65 degrees instead of 85. Another good turn out this year. We had people fly in and the regular good turn out from the locals. We had 6 airplanes and about 12 people that made the trip out to Catalina. It was a great day with good food and interesting people. For pictures, visit FFCAP on Facebook. A small turnout was made by 3 members (Bob Hume [flew his plane], Tom Wilson and Dave Duffer). Picture will follow when I get some. Young Eagles -- Unfortunately it was cancelled due to weather. Blame the weather service since we cancelled 2 days before and the actual day turned out OK, but with so much coordination and the numbers of people to notify it could not be held. We ended up with 4 airplanes and 7 people who made the trip and enjoyed the brunch. The weather was delightful and most of us stopped at Big Bear for gas ($3.24) either going , coming or both. 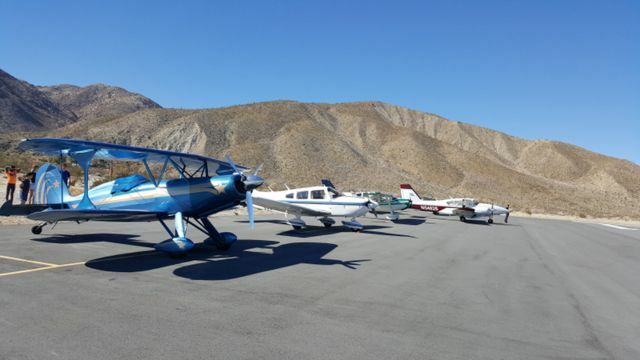 FFCAP’s first flyout of 2016 was to an old favorite: Borrego Springs. 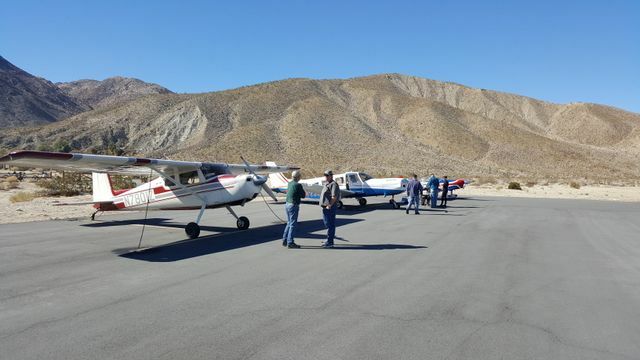 Five airplanes and nine members didn’t let the low ceilings prior to the flyout change their plans and enjoyed a perfect day in the low desert. Unlike previous Borrego luncheons there wasn’t something unusual traipsing around the Borrego pattern for our amusement, but the arrival of Bill Lund’s Starduster did give us a beautiful airplane to ogle. Lund is a friend of Tom Wilson and flew up at Tom’s invitation for a quick visit. Saturday, June 14th, 2008 -- Taco Dinner and a movie.